VILNIUS, Lithuania U.S. Secretary of State John Kerry will try to get European and Arab countries to support and participate in a military action led by the U.S. to deter the use of chemical weapons by Syrian President Bashar Assad's regime. Over the next three days, Kerry will meet with European Union and Arab leaders in Lithuania, France and the United Kingdom. Military planning is already underway to define the type of armed support provided by other countries in a proposed joint U.S.-France operation, according to a senior State Department official traveling with Kerry. The secretary of state, who has been the Obama administration's most visible and vocal supporter of intervention, will detail the military options and U.S. aid for some moderate rebels who are fighting on the ground. Kerry faces the diplomatic challenge of persuading some of the 28 member states of the E.U. and some reluctant Arab ministers to do more than publicly condemn Assad and the "friends" who provide military aid, which include Russia, Iran and the terrorist group Hezbollah. 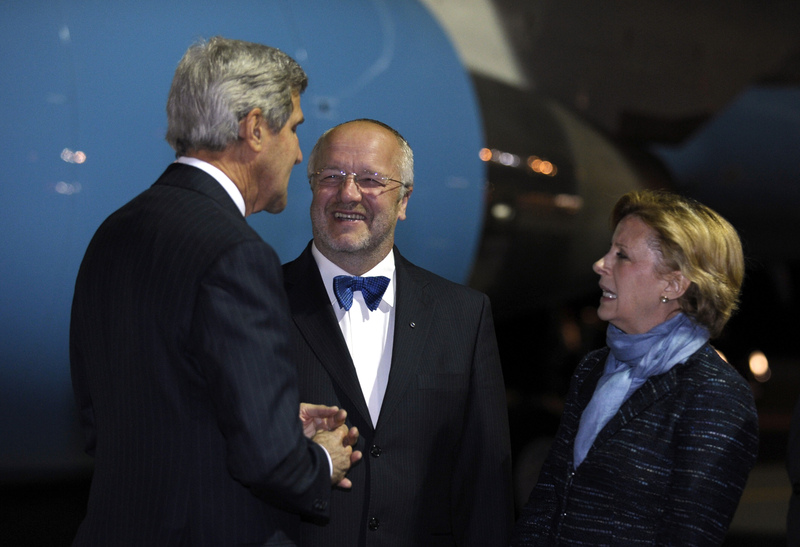 Kerry is in Lithuania to meet with a group of E.U. defense and foreign ministers as the country currently holds the presidency of the European Union. While Kerry campaigns abroad, the administration will try to court congressional votes to approve a limited military strike to degrade Assad's ability to launch another chemical attack. The August 21 sarin gas assault on the Damascus suburbs killed between 1,400-1,500 people per American and French intelligence reports. In a series of hearings this week, three of the president's top national security advisers explained that unlike the U.S.-led invasion of Iraq, this narrowly defined action would not commit the U.S. to a war nor commits American troops. Instead, this "hit and run" action is meant to send a message to Assad and to degrade his ability to use chemical weapons. No outside power has taken action to halt neither the Assad regime's actions nor the increasingly brutal war that has killed more than 100,000 people since 2011. The senior State Department official, who is very familiar with the Syrian opposition battling Assad on the ground, explained that a failure to act by the U.S. would further destabilize the region by driving up the flow of refugees. More than two million have fled into surrounding countries since the war began. Echoing Kerry's claims that the cost of inaction outweighs the risks, the official said a failure to act would likely boost support for al Qaeda-linked extremist groups, who are providing well-armed and trained fighters to battle Assad. Those extremists have begun to control territory and to target U.S.-backed moderate rebels in yet another front of the civil war. The U.S. effort to cultivate a strong moderate rebel force has been limited in scope and success. While the Obama administration acknowledges that the strikes are not meant to end the "grinding war of attrition" that is likely to continue long after any strikes, the U.S. believes that the Assad regime is gradually losing control of Syria. A senior official told reporters traveling with Kerry, that the State Department is beginning to help the moderate Syrian opposition establish "law and order" in areas that the Assad regime no longer controls. The U.S. will expand a program that provides training and communications equipment to a local police force in Aleppo. This is part of a campaign to help the moderate opposition gradually win support from the local communities. Earlier Friday, as Kerry prepared to depart the U.S. for Lithuania, the State Department ordered personnel to depart Lebanon due to security concerns surrounding the conflict in Syria. It also issued a travel warning to tell Americans to avoid all travel to Lebanon. Hezbollah, a terrorist group that is fighting on behalf of the Assad regime in Syria, holds control of major roadways and the airport in Beirut. It is also an elected political power. There is fear of retribution should the U.S. strike their ally Assad.